This is another one of those photographs where there’s a lot to see if you take the time to look. 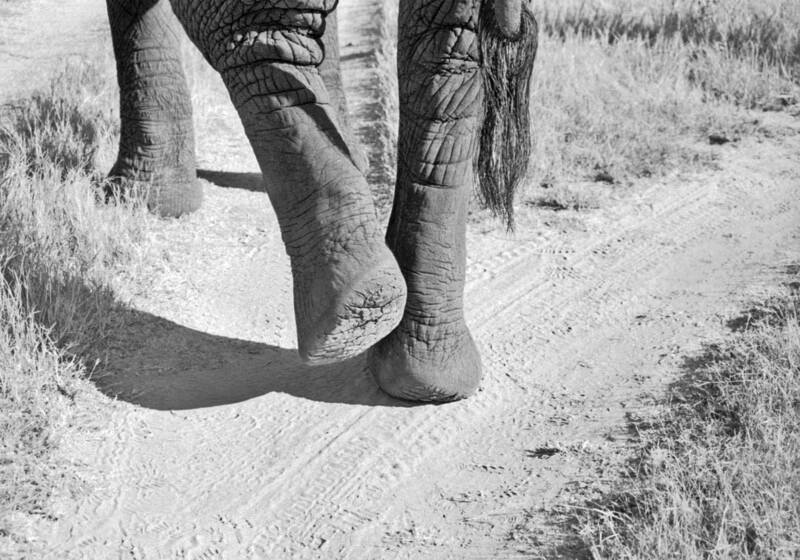 An elephant takes the left fork in a road, leaves behind footprints in the sand, reveals the thick, cracked pad on the bottom of his foot. See the depth in the wrinkles on his straight leg versus the ones where his leg is bent? Isn’t it odd how his two legs make one lumpy shadow and how, if you look carefully, how the tire tracks have their own little shadows? And did you notice the bootprints in the road, over the tire tracks? There’s a timeline here, too. The elephant is headed northwest, and it’s morning, his shadow tells us so. One tire track is still sharp; it was made earlier in the day. Then birds walked over it, and elephants, and humans. The grass is withered and dry, so it must be winter wherever this photograph was taken in Africa. And by now you’ve noticed everything, even the luxurious hair on the end of his tail. I love all the details! Nice photo Cheryl.